Come the holiday season I’m a cookie baking fanatic. Last year I made about ten different cookie recipes that yielded something on the order of 30 dozen cookies. Drop cookies, cut cookies, bar cookies – you name it, I bake it. Oddly though, I go on a cookie baking hiatus during the rest of the year. This is in some way motivated by the plain fact that cookies are my sweet treat Achilles heel. 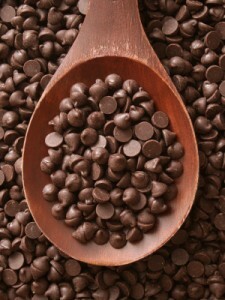 My house can be loaded down with chocolate, candy, or ice cream and I can easily avoid temptation. When cookies enter the picture though, the game is up. I’ll eat them until they are gone or until I physically remove them from the house, whichever comes first. Upon further consideration, I also think I avoid cookies most of the rest of the year because they are just a bit of a production. It’s not that making cookies is a particularly hard, but it’s a multi-step process that involves mixing bowls, cookie sheets, cutters, scoops, and more. And while I set aside plenty of time to truly relish in the cookie baking process from October to December, any other time it seems like another to-do I just don’t quite have time for. Recently I decided that the nine month cookie dearth had to go. After all, people love cookies. A good cookie can brighten your afternoon or turn a plain bowl of ice cream into something just a little more special. Cookies can be the sweet bow on a casual dinner party, a handmade gift that outstrips any gift card, and a valuable tool for bribing coworkers (or to show them how much you appreciate them I suppose). Given all the redeeming values of cookies, I simply must make more of them. I have not however found a way to add more hours to my day to accommodate regular cookie baking sessions, so I’ve been on the search for cookies that are easy as pie (which by the way isn’t necessarily easy but that’s fodder for another post). In what I can only consider a cosmic push in the cookie direction, I came across not one but two quick chocolate chip cookies recipes in the space of two weeks that were just begging me to try them. Clearly the universe is demanding I make some cookies! Both eschew the traditional drop approach to cookie formation, opting instead for bar cookies made in a baking pan and skillet respectively. You simply pat the dough in the pan and go. There is no scooping and dropping of dough by the tablespoon, no waiting for baking sheets to cool, and no endless lines of cookies on racks the counter. Each incorporates whole wheat flour instead of traditional white flour. While whole wheat flour as an ingredient wasn’t even on my mind when I started hunting easy cookie recipes, I consider it a bonus and I feel just a tad better as I’m sneaking cookies in the middle of the night. Of course both recipes are loaded with butter and sugar so I’m probably just delusional. I can live with that. They travel well so it’s easy to make them someone else’s temptation problem instead of my own. You don’t even have to cut and plate them – simply cover the dish or skillet, pack a table knife for cutting and spatula for serving, and go. Leave the dish or skillet behind as a gift for the recipient along with a copy of the recipe and you’ve created the perfect gift that keeps on giving. As you might imagine, both recipes can also be easily modified with different flavor chips, different types of nuts, and even the addition of dried fruit to create different flavor combinations. What’s not to love really? I happened across the recipe for Chocolate-Chip-Pecan Cookie Bars an article on lightening up recipes from nationally known bakers in the March 2011 Food and Wine. They use whole wheat pastry flour which is easy to find in most grocery stores these days. The fat and sugar content is quite reasonable (6 Tbsp of butter and oil combined along with less than a cup of sugar total), so while I wouldn’t call them light, they are on the lighter side as chocolate chip cookies go. Tip: Because there isn’t a ton of fat in the dough it doesn’t spread much as it bakes. To get smooth, even cookies spend a little extra time pressing the dough into the pan in an even layer. 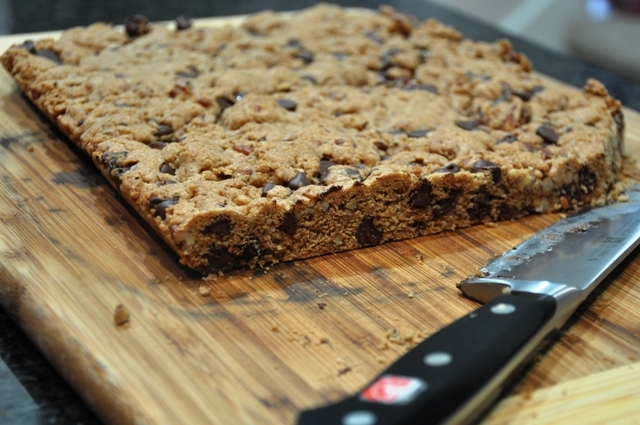 Baking the cookies in a parchment-lined pan makes it easy to move them to a cutting board when cool and cut them into any size bar you’d like. Cut smaller rectangles to serve at the end of a tea party or larger squares (or even circles cut with a round biscuit cutter) to create an ice cream sandwich. One of my favorite things about food blogging is being introduced to new recipes by food bloggers who have tested and tweak a recipe they found. It’s like finding a pot of gold at the end of a blogger rainbow. This cookie in a skillet recipe is a pass along from not one but two bloggers: Austin blogger and pastry chef extraordinaire Shelley of Franish Nonspeaker adapted this recipe for Whole Wheat Chocolate Chip Skillet Cookies from 101 Cookbook’s interpretation of Kim Bayce’s Chocolate Chip Cookie recipe Good to the Grain. 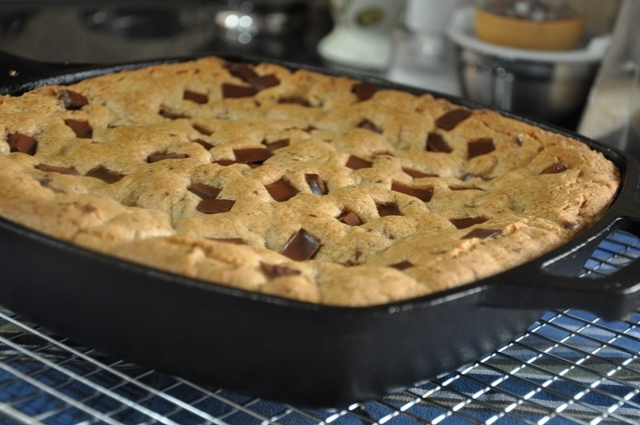 Think of it as the “it takes a village” approach to a skillet chocolate chip cookie. Other than making my cookie in a 9 inch pan instead of a 12 inch, I made it exactly as Shelley wrote it. The result is a dead-simple cookie that’s nutty from whole wheat flour, chock full of chocolate chunks, and perfect for slicing and topping with ice cream as if it were the aforementioned pie. In fact, this recipe is much easier than pie. It took me 20 minutes to make the dough, get it into the pan and into the oven, and get my kitchen cleaned up. Because I happened to have whole wheat flour and Scharffen Berger baking chocolate on hand, so I didn’t even have to go to the store. It was a win all around. The other recipe ingredients are all common pantry and refrigerator items, so if you keep some whole wheat flour and chocolate about, you’ll always be ready to throw together a quick dessert that anyone will enjoy. So friends, if you are like me and avoid cookies as an quick fix treat because they take too much time or create too many dirty dishes, I’m sorry to say (or not really) that those excuses won’t hold water, or chocolate, any longer. With recipes like these we can fill our kitchens with homemade cookies on a moment’s notice. As for choosing between devouring the cookies all by your lonesome right from the pan or sharing them with friends and family, well, I think that’s a situational dilemma best left to your good judgment.